Weed Fire: Hwy 340 and Ridges Blvd. Address: Area of Hwy 340 and Ridges Blvd. 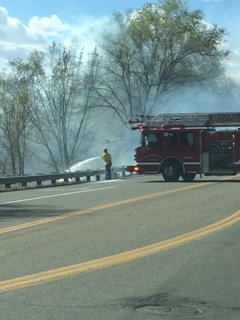 The Grand Junction Fire Department responded to a weed fire near Hwy 340 and Ridges Blvd. Engine 5 (on scene within 4 minutes of the original dispatch time) reported that the weed fire was in the culvert and running up towards Hwy 340. After requesting additional units to assist in fighting the blaze, Engine 5 crew stopped the fire from hitting Hwy 340 by using their Compressed Air Foam System (CAFS). With CAFS we are able to place a foam blanket on the fire and smoother it. This gives crews time to get ahead of the fire and work to eliminate any hot spots or flare ups. The fire was contained to approximately 1-acre. No structures were involved and there were no injuries to the public or our firefighters on this incident. The cause of the fire is under investigation at this time and all fire investigation questions will be handled by the Grand Junction Fire Marshal’s Office @ 549-5800. Check weather conditions prior to burning. The winds changes frequently here in the Grand Valley and it is important to make sure you check CURRENT conditions prior to burning. Burn Permits can be purchased at Fire Administration (625 Ute Ave.) for $15.00.